As you should know if you’ve been working with metal for a while now, there are tasks that are tiring and harder than necessary if you don’t have the proper equipment at hand. For the best results you need to use a tool that is specifically suited to whichever material you’re working with and whatever project you’re building. So if you’re working with metal, and you’re looking for a drill press then you need to choose one built specifically for working with metal. That’s why we’ve put this guide together. To help you get the best drill press for metal work. And to help you do it without breaking your budget! The first thing to remember when you’re operating a drill press with metal is the basic safety procedures. For a start always clamp the piece you’re working on down firmly. You can use a drill press vise or C-clamp for this. If you forget to secure the work-piece it could spin out of control, the worst case scenario could result in a serious injury. Another factor to consider when working with metal is to wear safety goggles. Safety goggles are a must-have because metal shavings more so than wood shavings are very dangerous for your eyes. Because metal can be very tough to penetrate you should choose a drill press that has a motor with at least 1/2 HP. The more the better. Ideally it should also have adjustable speed settings, as depending on the metal that you’re drilling into you will need to either speed up or slow down the drill bit. 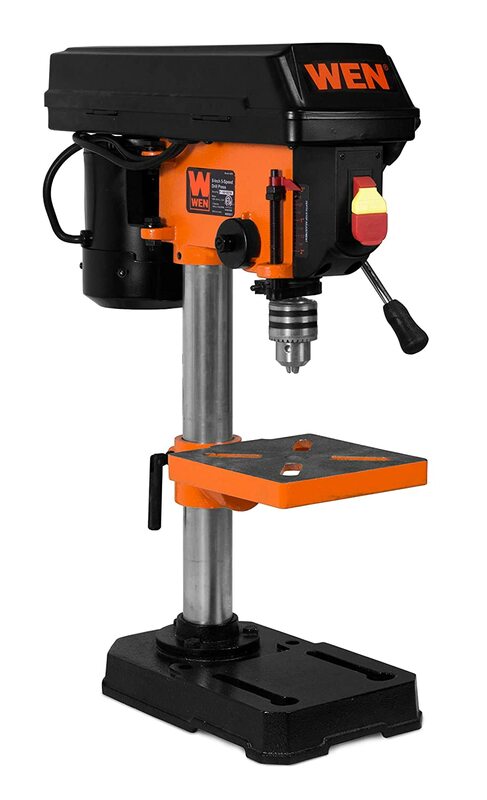 Keeping in mind all of the factors listed above, the WEN 4208 is a great drill press all-around, and specifically for those wanting to work with metal. It’s also perfect for wood and helping you complete other hobby projects.